This Service Level Commitment and Terms of Service covers The Rub BBQ’s catering service from 1st November 2018. It is our declared commitment to you, our client, of the standard of food and service you can expect from us and, in a few cases, what we expect from you. The service covered by this commitment and terms are for pre-paid catering including weddings, private parties and corporate lunches. We will always aim to provide interesting, simply prepared, flavourful, and where possible locally sourced “honest” food. Our food safety procedures are audited annually by third-party consultants. Our kitchen management and Head Chef have CIEH Level 3 Food Safety Qualification. We hold a 5-star rating for our local authority assessed food safety. Our food suppliers are a very important part of our ability to bring you the best quality and most environmentally friendly food. Because we make virtually everything ourselves, we buy raw ingredients – meat, vegetables, fruit and dry goods. All our meat and is UK farmed and sourced. Substitutions may rarely have to be made but our client will always be advised of this and where possible two alternative options are given. Please contact us directly to discuss any dietary requirements (vegan, vegetarian, gluten free, dairy free) you may have so we can best advise. If an item contains nuts, we will state this fact but cannot guarantee that those items not stated such do not contain any traces of nuts. Much of our food involves bread and rolls which bakers are seldom prepared to guarantee as free of nuts. Allergen information for all our food is available from us. If any of your guests have particular dietary requirements, please state this at the time of ordering, and we will suggest suitable food and arrange for the food to be on separate. You may have hired, or we may have loaned you some equipment (e.g. crockery, cutlery and glassware) as part of your catering requirement. This equipment remains the property of The Rub BBQ and must be kept for our collection. Any breakages or loss of equipment will be invoiced at cost. Menu tasting can be available on request for wedding couples. This can be done at an arranged date or by visiting one of our street food events but will need to be booked in advance. 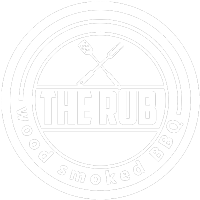 The menu choice may vary due to the nature of our business, and the food tasting session should be viewed as an overall view of the flavours and philosophy of what The Rub BBQ can offer. Deposits must be taken in order to confirm a date booked. Deposits are non-refundable. We are human, and despite the best systems and efforts to avoid it, a mistake may very occasionally happen. If something is missing or incorrect on the day, do alert us immediately as we will want to rectify it. Some menu prices may be changed at any seasonal menu change. We always aim to be competitive in our pricing and are confident you will consider our food and service to be extremely good value. We are not currently VAT registered so VAT will not be charged on any items from us. We consider our food and service to be very good value and do not, therefore, not give discounts unless we are running a promotion, or otherwise agreed. Your invoice will be emailed to you as soon as is possible. In any event, please ensure the invoice is made available to your accounts payable department to allow timely payment. A 25% deposit is required upon confirmation of a booking (50% if the booking date is within four months), and balance is payable 28 days prior to the event date. Payment can be made by Paypal or direct bank transfer. We aim to minimise our impact on the environment in everything we do. We send zero waste to landfill and encourage you to do the same. We use eco-friendly disposable items when possible. Sustainability is a big subject for us and influences every decision we make. We have specific documentation informing what we do in this regard and is available on our website or speak to us directly. Be however assured that in all areas of sustainability, social, economic or environmental, we endeavour to make the right decision and follow the right path at every opportunity. Thank you for choosing us and please be assured we are always committed to making orders to your complete satisfaction with food that will delight you and your guests.